If you can think both logically and creatively and want to help connect customers to the products and services they need and be an active participant in the dynamic global marketplace, Marketing may be the degree for you. 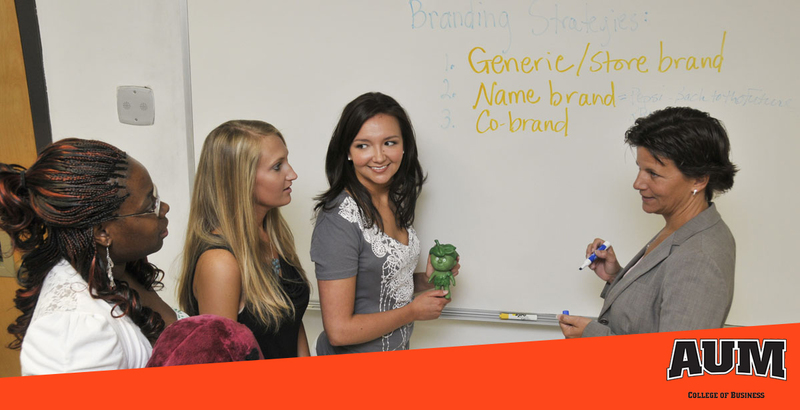 At AUM, you’ll master the skills and knowledge you’ll need to appeal to customers in the constantly changing business environment. Your degree will equip you for a variety of careers in marketing management, marketing research, advertising and promotion, and sales. Within the marketing major, you can also select the Hospitality and Tourism option. Marketing students have interned with companies like Leadership Alabama, Sherwin Williams, Girl Scouts of Alabama, and Renaissance Montgomery Hotel & Spa at the Convention Center. Marketing students have established a partnership with AUM Athletics faculty and promote and run concessions to earn revenue for their club. Marketing Club members presented a merchandising layout and targeted social media campaign proposal to a group of executives from Bonnie Plant Farm, supplier to Home Depot. Note: While salaries vary depending on several factors including your level of experience, education and training, and geography and industry, here is a sampling of the future job growth and salaries in this area. Major in marketing and choose from a range of well-paying jobs. Job growth in management occupations is predicted to be about average — six percent from 2014 to 2024. Salary expectations, however, will be far higher than average. Management occupations have the highest annual wage of the major occupational groups — a median annual wage of $97,230 in May 2014. Gary Soriano is the franchise owner of Chick-Fil-A EastChase in Montgomery, Ala. Gary and his wife Susan established the Gary and Susan Soriano Chick-fil-A Scholarship to benefit a Chick-fil-A at EastChase employee who attends or will attend AUM. Mallory Anderson is an Account Manager for Outside Sales at medical sales with Specialty Labs. Jimmy Hill is president and CEO of River Region United Way. Shaun Culligan is the Economic Development Manager for Phenix City, Ala. The course listings below are a representation of what this academic program requires. For a full review of this program in detail please see our official online catalog AND consult with an academic advisor. This listing does not include the core curriculum courses required for all majors and may not include some program-specific information, such as admissions, retention and termination standards. The scientific examination of marketing phenomena to enhance a manager's ability to make better decisions by generating, transmitting, and interpreting consumer and environmental information used to identify and define marketing opportunities. Prerequisite MKTG 3310. Treats sales as an entry-level and career opportunity. Focus is on building and managing customer relationships as a key marketing strategy. Focus will be on students preparing and delivering sales presentations. Prerequisite MKTG 3310. Buyer Behavior introduces the student to concepts and theories as they relate to consumer and business markets. This will include and analysis of internal and external influences on exchange decision making process. The frameworks are discussed in context of advertising/promotion, product management, and the development of effective marketing strategies. Prerequisite MKTG 3310. Covers the role of marketing in the global arena and the impact of culture, law, policies, ethics and other environmental variables on strategies for marketing goods and services in a global market. Prerequisite MKTG 3310, ECON 3050. Planning and development of marketing strategies including opportunities assessment and competitive analysis. Focus on application to present the student with major marketing decision areas. Examines traditional and contemporary marketing strategy alternatives. Prerequisite MKTG 3310, MKTG 4360, MKTG 4410.